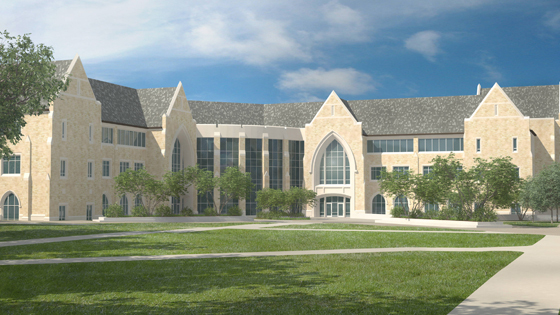 The construction project was a new $52 million, 180,000 square foot Athletic Complex including a gymnasium; indoor track; recreational basketball, volleyball, and tennis courts; fitness, aerobics, and weight-training areas with locker rooms; natatorium; offices; and miscellaneous places of assembly. HEI provided design build documents for the new plumbing, HVAC, temperature controls, electrical systems, and fire sprinkler performance specifications for the facility. The design included redundant constant volume air handling systems for the field house and arena, variable air volume systems for the offices and fitness centers, a total energy recovery system for the locker and shower rooms, and a mechanical dehumidification system for the natatorium. The facility is connected to the campus central heating plant. However, a summer boiler plant was designed integral to this facility. A new water-cooled chilled water plant (two 285-ton chillers) was designed for the facility for integration with the Anderson Student Center for added reliability and efficiency. HEI also provided Commissioning services for this project as well.